His elder sister, displeased, said, “Mum, Daniel is saying hmmmm to me when I have not done anything to him”. She assumed that he was telling her to go away or something like that. I then had to explain to her his own meaning of the ‘Hmmmm’ that he had said since he couldn’t do that by himself. He was not even talking to her in the first place. He was simply enjoying his food and that was his way of saying that the food was sweet. You see, we sometimes make assumptions about our friends, spouses or relatives which may not even be true. You assume that if you raised an issue with your spouse, he would flare up so you decide not to talk about it and thus give power to resentment against him/her. You may assume that your in – law’s stare at you from the other side of the hall spells displeasure towards you and then you conclude that she is haughty. It’s possible also to assume that your spouse’s apology is insincere and prolong the duration of your disagreement. All these and more may be wrong assumptions which obviously give results that are unhealthy for your relationships. Assumptions sometimes kill relationships. Wrong assumptions have a way of driving a wedge between people and if not handled maturely and wisely, may be the cause of the souring of such a relationship. 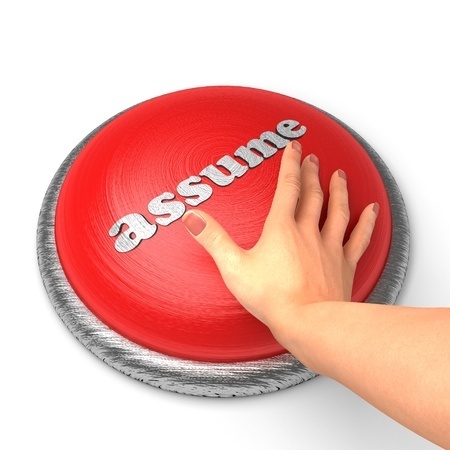 It is therefore imperative that we be wary of making assumptions about people. You are not God who knows the intent of the heart of all men. Peradventure you have even made assumptions that ended up being true, it doesn’t necessarily mean that you’re right this time. Instead of assuming things, especially negative things, make sure both parties communicate effectively about whatever the issue is. Ask questions and give answers where necessary. Effective communication is the medicine for assumptions. No relationship can thrive without proper communication. And no relationship based on assumptions will thrive either. If you want a practical example, look at God’s way of relating with us. He could have assumed that since He has placed His Spirit in man, man should always know what to do. Instead, He clearly states the terms and conditions attached to our relationship with Him. He has always gone the way of communication. May God help us to follow God’s example for fruitful and blessed relationships!